I have been participated in some interesting discussions lately about genius hour or 20% time or passion based learning. It certainly seems to have gained traction with lots of teachers. Again like anything else that's being done it will fall over if yo go into it without any structure. If you go and look at schools running this successfully and just try to do it in yours it could quite possibly fail. It has to be purposeful. It has to explicitly fit inside a learning vision- preferably a school-wide vision. You need to be able to articulate this. Learners and teachers need scaffolds and buy in and understanding of why it is being done. Invariably alongside these discussions comes the questions about how to deal with students who just don't have anything they want to engage in when you give the learning over to them. We run passion classes at TKAS every day. (Our Inspire programme was the forerunner to this-see appendix below.) We run three period days and our passion classes run for one of those each day. They are a third of our total learning programme. Our learners don't have much choice about passion classes. They are assigned to them on a weekly basis. Teachers repeat a passion class each week for 3-4 weeks and then design and teach a different one, so most learners get to do most passion classes. @garystager said on twitter earlier this year: schools should introduce kids to things they don't yet know they love! This is what our passion classes are for. Our learners have huge choice in the rest of their learning. They learn through inquiry. They are expected to be working on at least two inquiries at any one time. One that has been offered and designed usually by two teachers working together, and another that is their "flow inquiry." Students self direct their learning in these other two periods. They construct a timetable and follow it. Teachers are available to support and assist learning. They offer workshops to help students progress their inquiries. Flow inquiries can be anything that learners want to be inquiring into. When we first started offering this as an option, we found so many of our learners just couldn't decide on anything to inquire into outside a very narrow range of interests. Our passion classes are designed to help this. We make them compulsory and assign learners to them, and we talk to learners about the fact we want them to try things out for a week, and if they want to take that learning any further then they can start a flow injury on it; if not they have had a valuable learning experience. They are designed to promote high levels of collaboration and engage learners in developing high levels of oral communication. We run them multi level (all Year 3-7 together, all Year 8-13 together) which means learners can be exposed to a range of classes that may become passions for them from a range of adults. The beauty of a school set up around collaborative teaching is that we can offer this flexibility. All of our learning focuses on and aims to build our students "learning muscles." (See previous blogposts.) Our passion classes are about opening the doors to curiosity for our learners. Our desire is that by developing their curiosity we are giving them multiple opportunities to discover a wide range of passions. This is a really important learning muscle for our learners and a positive outcome from passion based learning. And all passion experiences contribute to our learners growing their understanding of themselves as a person aligned to the Tapa Wha Hauora model. At the end of each week learners reflect and summarise their learning within their portfolio. They identify the learning muscles they have stretched, and the quadrants of the Tapa Wha model they have strengthened. And only after they have done that do they get to considering learning areas they have developed knowledge and skills in using school learning area progressions. 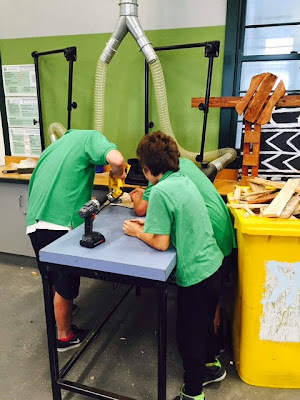 A "senior class" with a Year 7, Year 10 and Year 13 learners all working together to create kaitiaaki maara. A "junior" passion class on forced perspectives. In 2011 when we opened we started running a programme called Inspire. All day class every Friday. The classes ran for a term. Year 7-13. Students selected their class, although some had a number limit. Because we were on a temporary site and we were squashed we encouraged staff to take classes out of school. We ran surfing classes, and fishing classes. We took environment art classes, and ran survival type classes. We used a relieving teacher to offer French one term. We ran some music and dance classes. We tried to get learners out into the real world. In our second and third year we operated with no access to any specialist technology facilities at all. So we ran all these different Inspire classes to expose learners to things upside of the school environment. Things they might not get exposed to on their own. These classes were designed to inspire our learners and to get them to transfer this part of their learning back to other learning. And they worked. Learners and teachers did become inspired in a range of things over the years. They were our first attempt as a school at passion based learning. Now, when so much of our normal classroom learning is based on inquiry learning and self directed learning we identified we had changing needs to meet and have moved to daily passion experience classes in 2015.